My three-year-old daughter is in the middle of a pretty serious princess phase. When I was given the chance to review the Little Tikes Gear Works Princesses, I knew she’d be just the person to give me objective feedback. Little Tikes was founded in 1970, and has been creating children’s toys, ride-ons, climbers, creative arts, and furniture that have been marketed worldwide. They were the first toy company to give an 800 number for consumers, and to this day still imprint the number and website information on their products. They were also the first toy company to offer on-site daycare services to their employees that also served as a test center for product development. The Gear Works Princesses is for children 3 years and up. 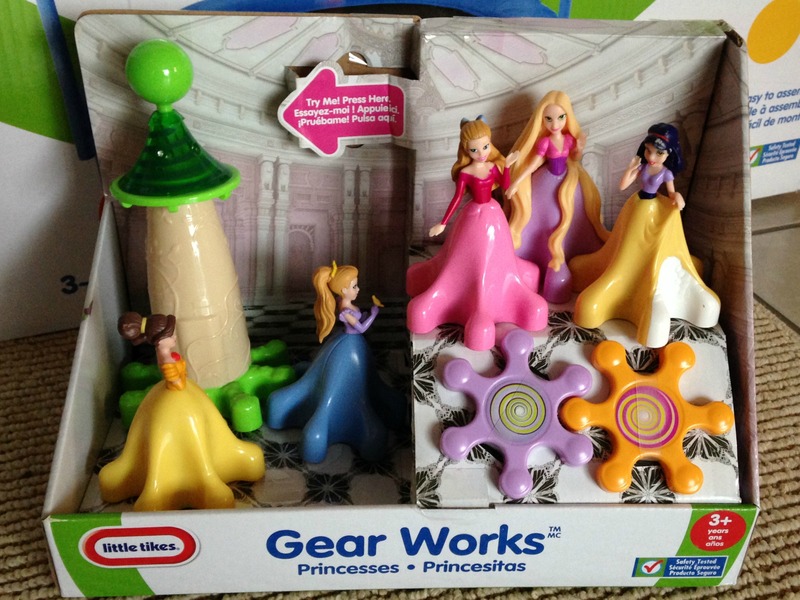 It includes 1 musical light up tower, 5 princesses, and 2 flat gears. 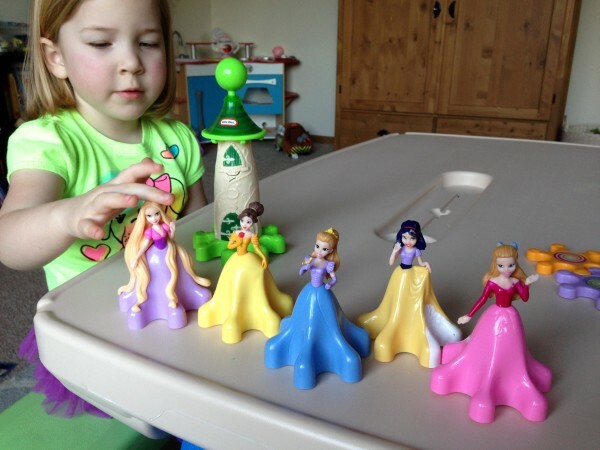 A child can attach the gears and princesses to the tower in any order they’d like. Once attached, all of they have to do it press the top of the tower to see it light up and play musical sounds. 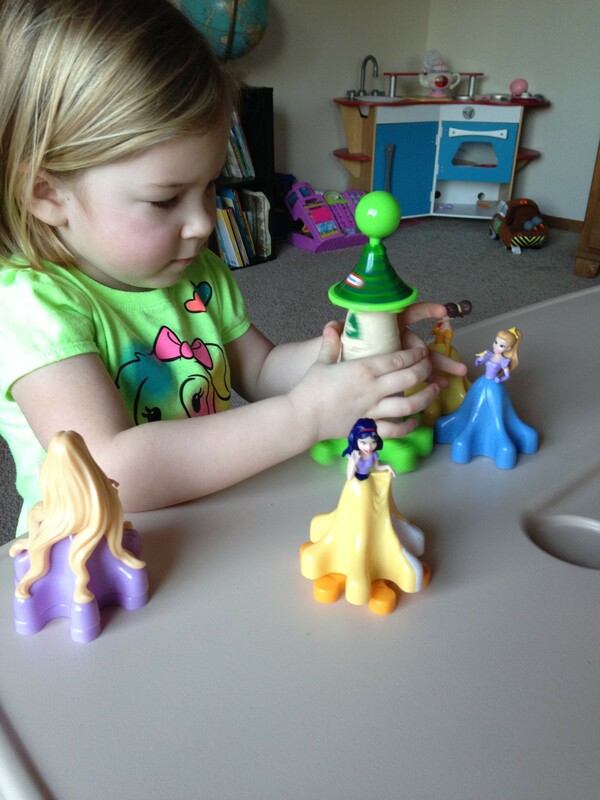 Each princess and gear attached to the tower will then spin. Each piece has a rubber disk on the bottom that helps it to loosely grip onto a table top or other hard level surface. My daughter liked to attach the princesses and watch them “dance”, but she would occasionally get frustrated that the pieces wouldn’t stay linked together very well. This eventually led to her turning it into a game to see how many she could get to link together without having them separate and stop spinning. I’ve also seen her using the princesses with other toys she owns, so I know this hasn’t deterred her from wanting to play with them. I found that the Gear Works Princesses resemble a handful of popular Disney princesses. So much so that my daughter was even able to identify a few of the Gear Works princess with the Disney equivalent all on her own. They are pretty cute princesses, and with a solid plastic design we don’t have to worry about losing tiny accessories or small pieces that could pose as a choking hazard. They have also held up to wear and tear pretty well. The Gear Works Little Princesses can be purchased on the Little Tikes website at www.littletikes.com for $24.99. You can also purchase this toy at Target, Walmart, or Toys R Us. What a cute toy! I bet the little girls love watching them twirl! What a neat little toy. This would make a great present for some little girl. They sound like a lot of fun.